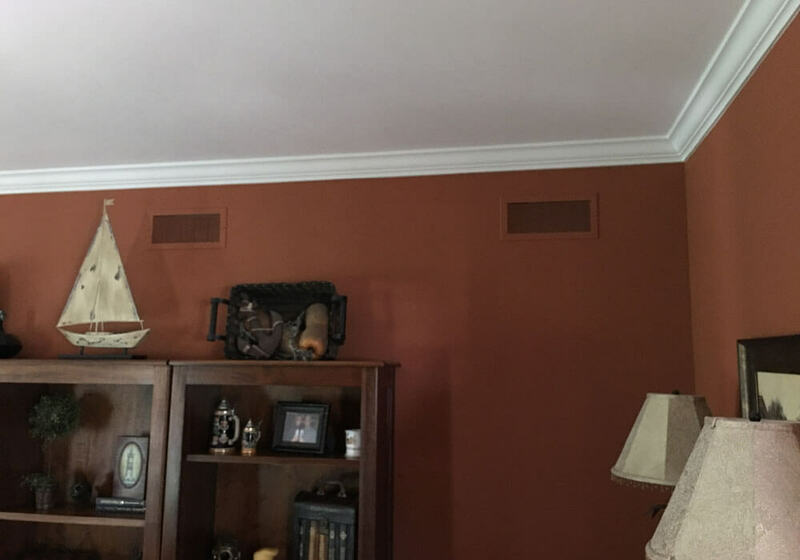 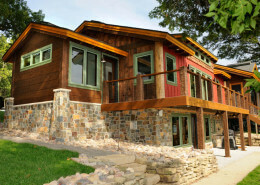 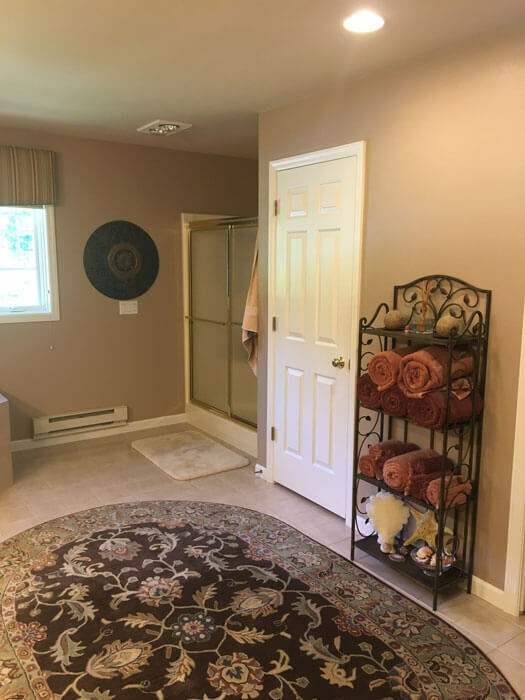 Vive Home Transformations completed a house remodeling project for a Fitchburg, Wisconsin, couple who wanted to upgrade their master suite, mudroom, pantry and guest bath. 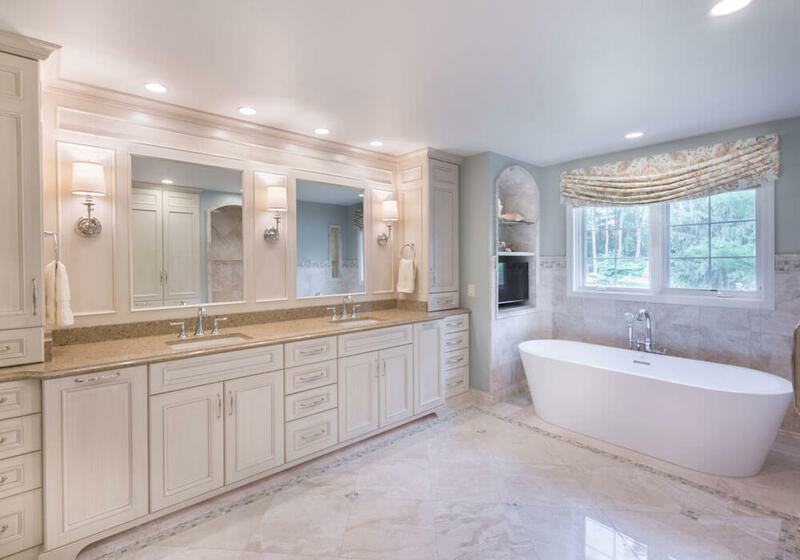 Neutral colors and touches of elegance and comfort throughout the master suite resulted in a tranquil, spa-like atmosphere. 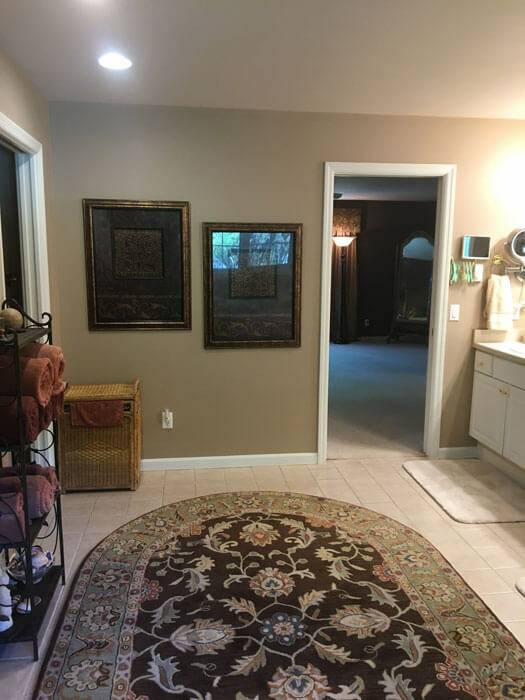 The master bedroom was repainted and crown detail updated. 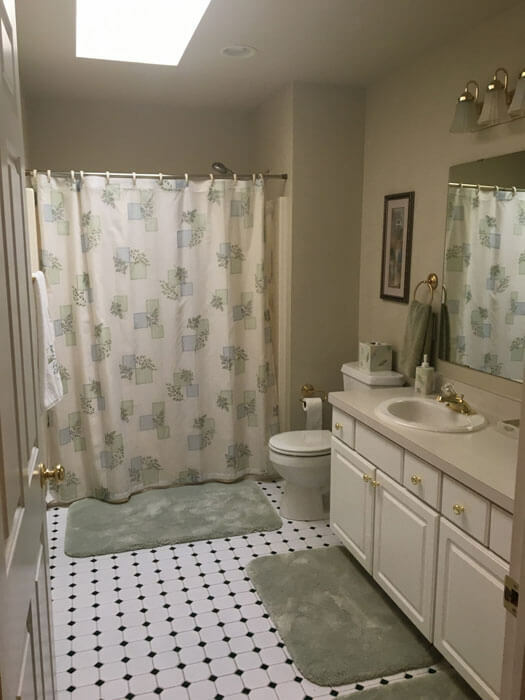 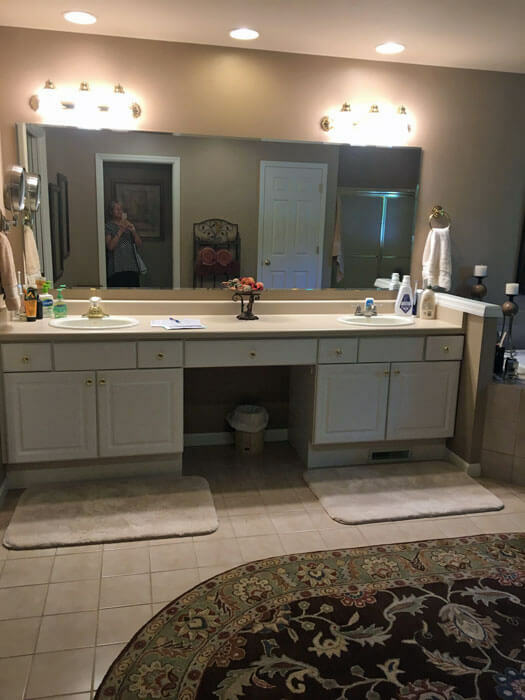 The master bathroom was completely re-designed. 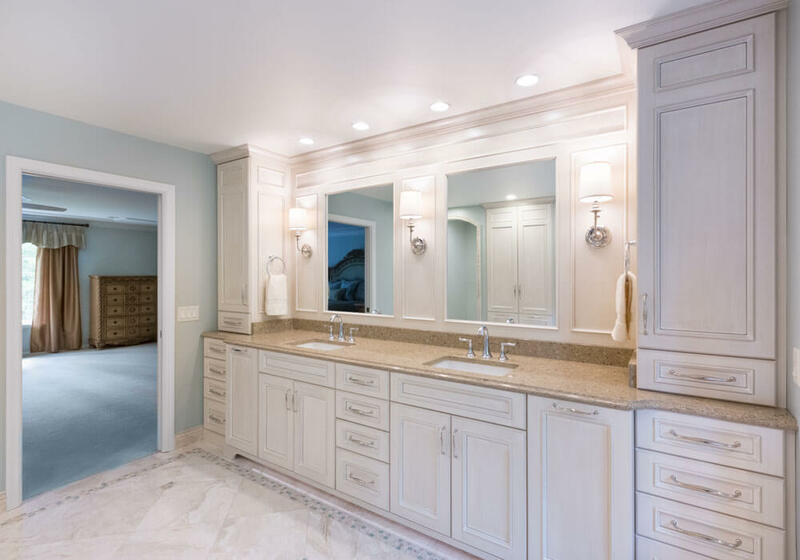 Custom built-in maple cabinetry with a Vintage Nordic White finish are complemented by Cambria quartz countertops in Linwood and matching wainscoting surrounding the mirrors. 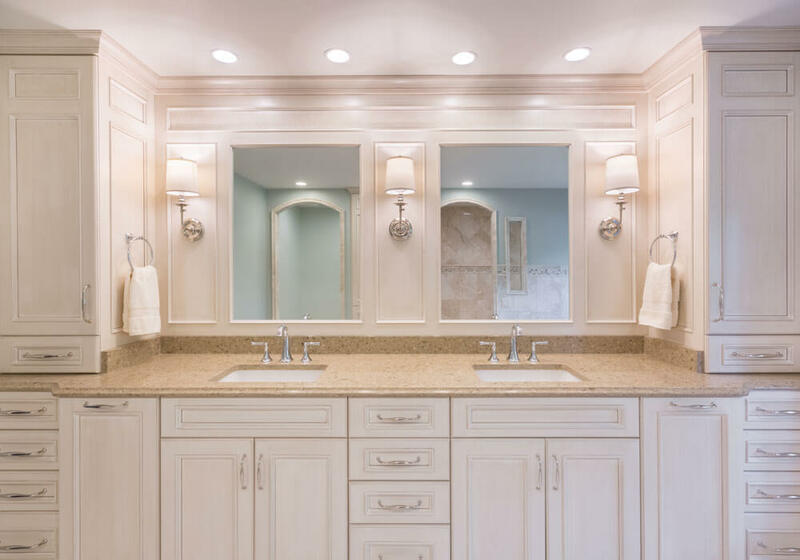 Recessed lighting provides warm brightness throughout, while under-vanity and wall sconce accent lighting highlights the traditional design. 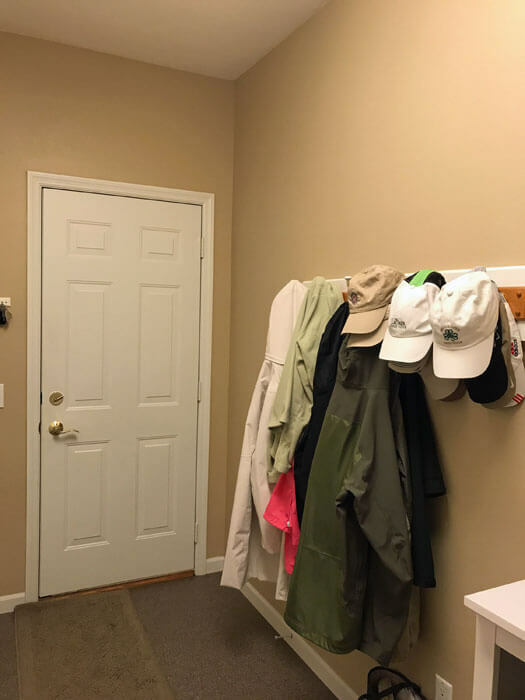 Inverted doors lead into the closet, which features tilt out hampers. 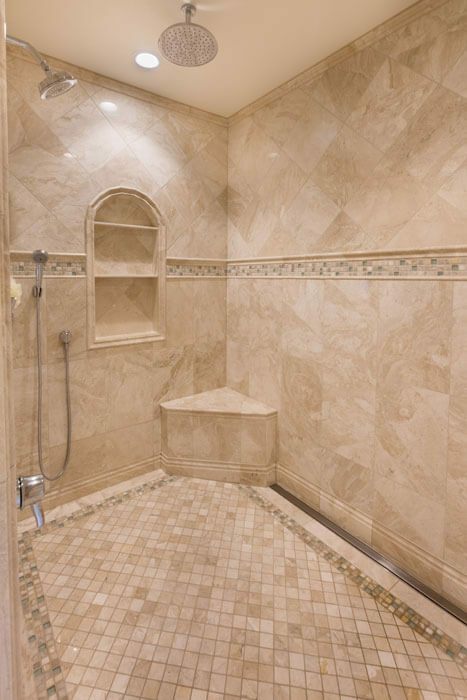 A large, zero-entry tile shower replaced the existing smaller, enclosed shower and features a niche and corner bench. 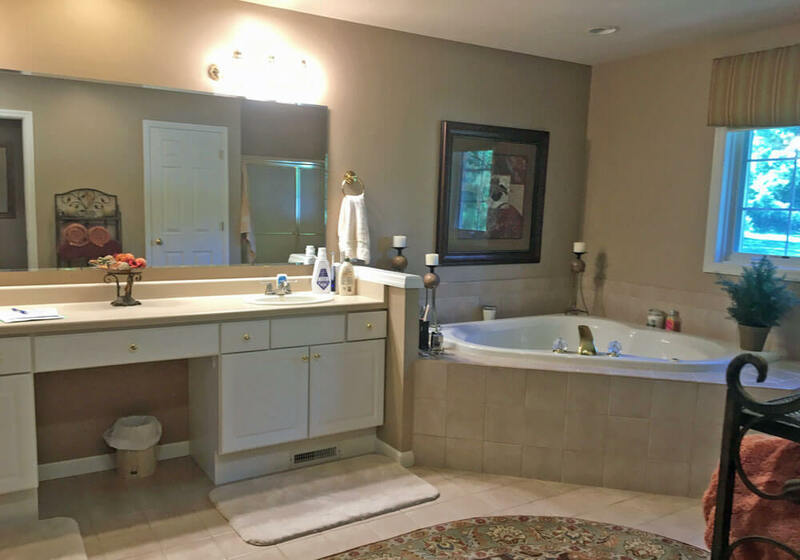 The homeowners chose a trench drain instead of the typical drain centered in the shower floor, as well as a rain shower head. 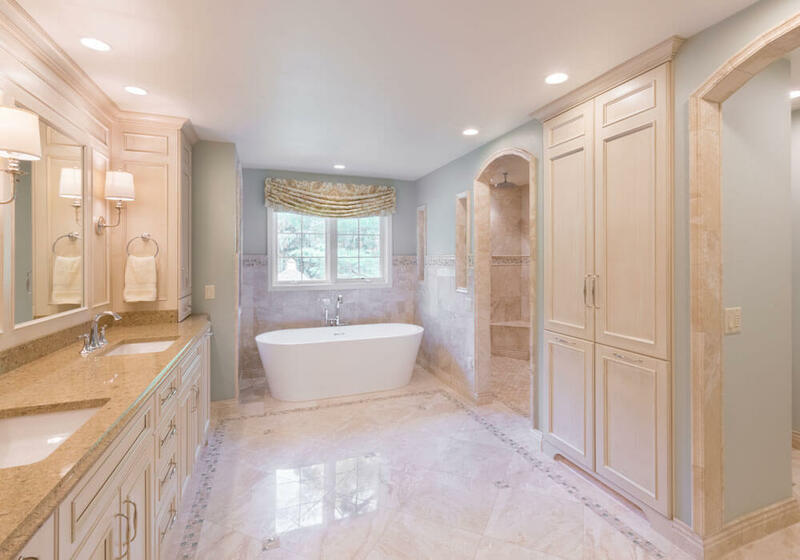 Natural stone tile frames the walk in shower and toilet room. 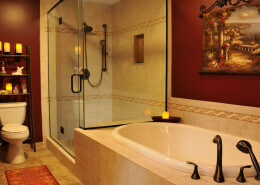 Tile wainscoting surrounds the tub, where a feature niche was added specifically for a television. 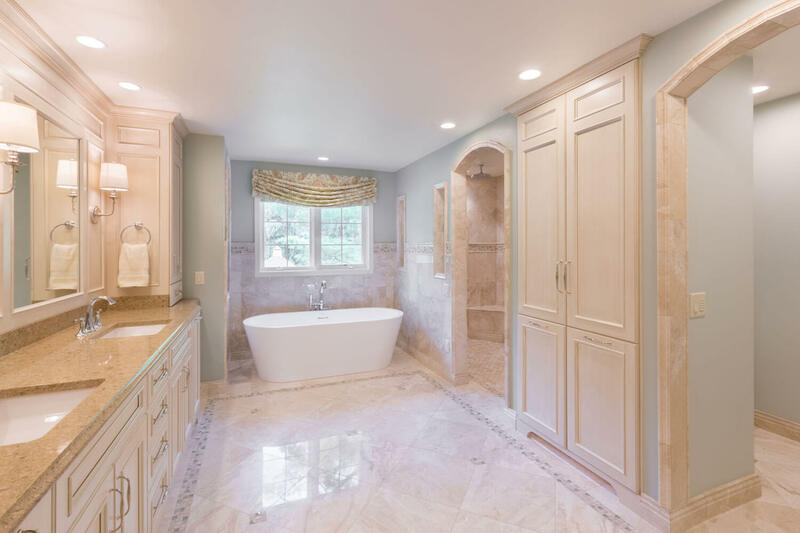 The bathroom is anchored by the glossy tile floor, the pattern accentuated by a detailed border. 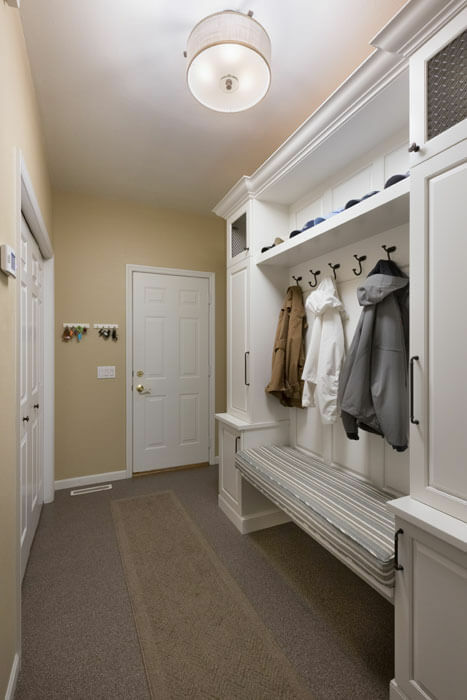 In the mudroom, adding a custom, open bench with seating and storage on both sides provided significantly increased functionality. 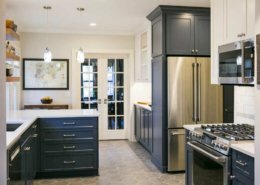 Raised panel cabinetry in a Nordic White finish maintains consistent design throughout the house. 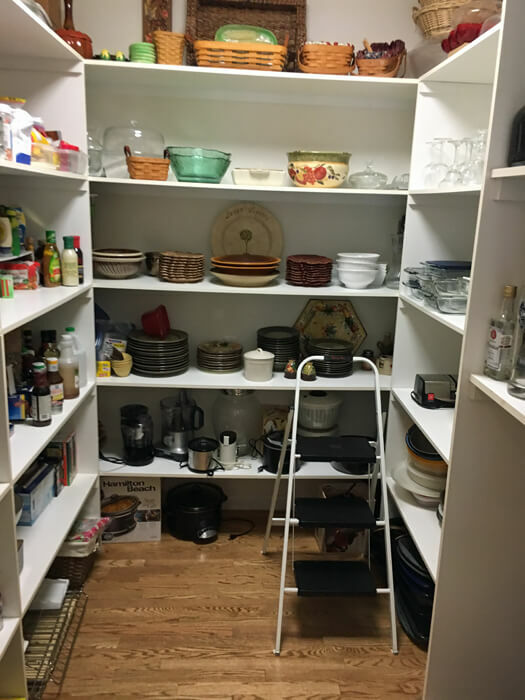 In the pantry, the standard existing shelving was replaced by Nordic White raised panel cabinetry to the ceiling. 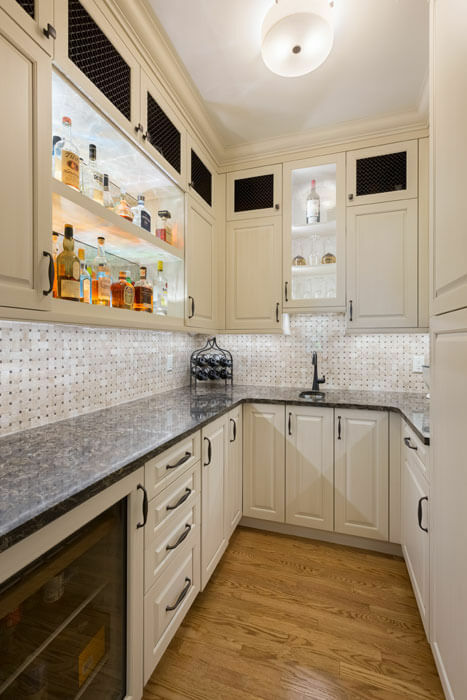 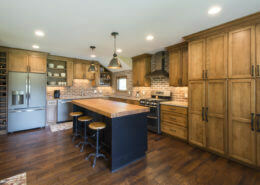 This provided more storage and a finished look, as did the under cabinet lighting and up lighting on open shelves, Cambria quartz countertops, clear seedy glass, and mesh metal cabinet fronts. 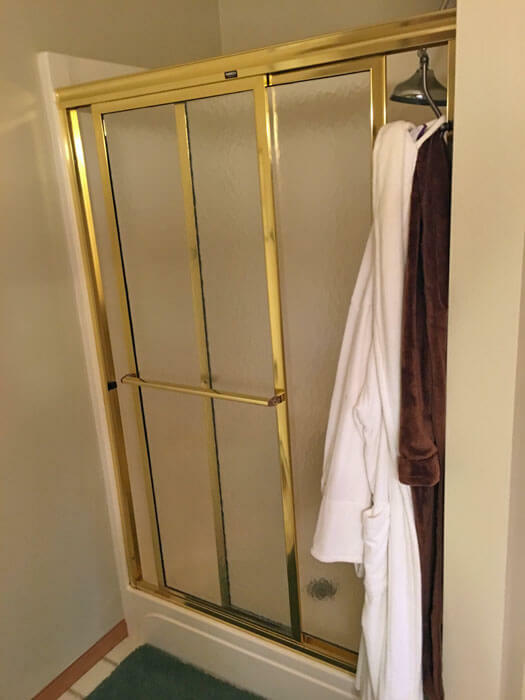 In the guest bathroom, Vive opened up a wall to add storage in an otherwise unusable space. 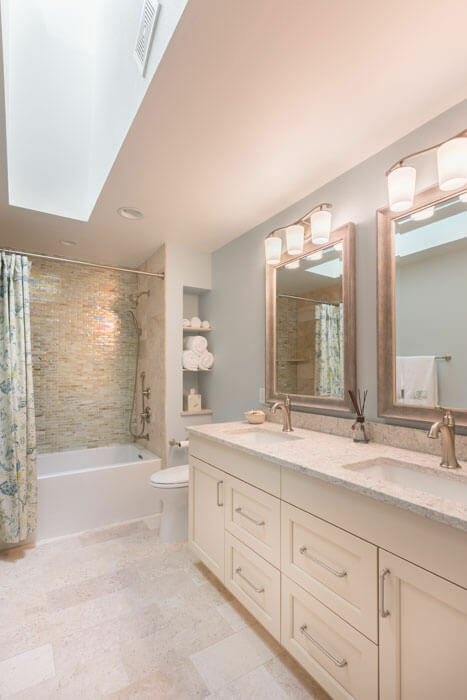 Finishes include recessed cabinetry in Silvered Almond, LG Aria quartz countertops, tile flooring and iridescent shower tile.